Pot Bowl. Bong Bowl. Stoner Bowl. Weed Bowl. Stupor Bowl. Smoke-a-Bowl. We’ve heard them all by now. 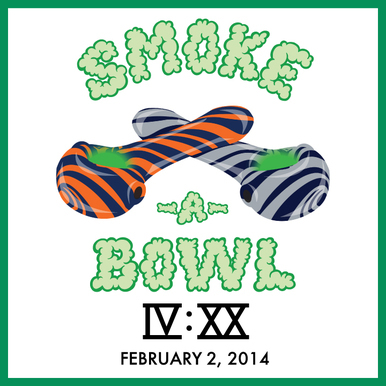 With all of the attention on the state of smoking affairs in Colorado and Washington, Super Bowl XLVIII merchandise is hitting a whole new level — which isn’t exactly high. The stereotypical fashion culture among pot smokers isn’t all that high either. But as the new style columnist for The Cannabist, I’ll be sharing the latest on how to make marijuana look good. From stoned shopping guides and buzz-worthy accessories to cannabis couture and artist sessions, this is going to be a pretty fun gig. Feel free to share news and feedback by e-mailing me here. But back to the Bud Bowl. Here are the Top 10 worst of what’s out there to show your legalization spirit on Super Bowl Sunday. 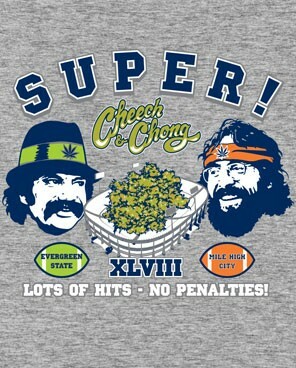 From Cheech and Chong’s official store. 10. Super! 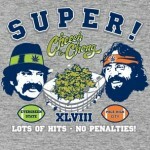 : Who knew there was a Cheech & Chong official store? For $20, it’s legit heather gray and there’s still time to order in time for game day. 9. Broncos Baja Hoody: Stoners of the ’90s, you remember these, right? Maybe you’re even still wearing one? While not actually for sale, Austin Huff of the sports comedy blog Korked Bats proposed the Denver Broncos unveil them as their new uniforms. What if? This (mostly) original design can be found on Etsy. 8. Sunday Funday: The worst hashtag ever has been adopted in wearable form. An original design dreamed up by a local artist, there’s only a limited number available for $28 on Etsy. Hey, at least it’s not pink. 7. The Stoner Bowl Pegger Hoodie: Look close … it’s a bong! Not to be confused with “The Stoner Bowl” shop, the press is also touting Denver’s Bryan Weinman’s redesign of the Vince Lombardi Trophy. However, his THC take on the NFL logo is clever, although questionably legal. 6.-4. Bumper Active: Bumper Active wants you to “celebrate this historic moment” with three equally awful T-shirt and sticker designs. But $5 from the sale of every T-shirt and $2 from every sticker pack benefits the National Organization for the Reform of Marijuana Laws (NORML). Get it? There’s a Broncos pipe and a Seahawks pipe? 6. Dueling Pipes: Is that supposed to look like pot? 5: Smoke-a-Bowl IVXX: “IVXX” = 420, and this is not NASCAR. 4: Smoke-a-Bowl Party: Graffiti … gross. 3. ERRRRRRRBODY: We’ll give Denver-based Igor’s T-Shirts credit for the “Bronchitis” design. But no, kickoff is at 4:30 p.m. (Mountain Time), and there will only be one winner. 2. Kickoff: Seattle-based Nate Johnson, who also owns a dispensary, has gotten a lot of ink when the news of his online apparel shop hit Reuters earlier this week. But is that Comic Sans MS? 1. 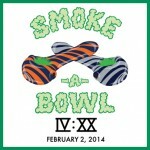 The Smoker Bowl Tee: Someone tell me how these are SOLD OUT? 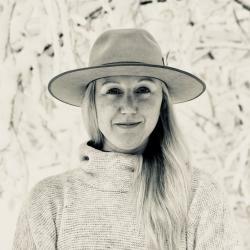 The team behind the website created by Shopify is based in Denver and promises a catalog with new designs on the way. Can’t wait! If you really have to wear your weed instead of just plain smoking it, check out Denver shop Megafuana (3102 Blake St. in RiNo). Owner John McCaskill has a limited edition T-shirt in the works that will be available for presale this weekend. 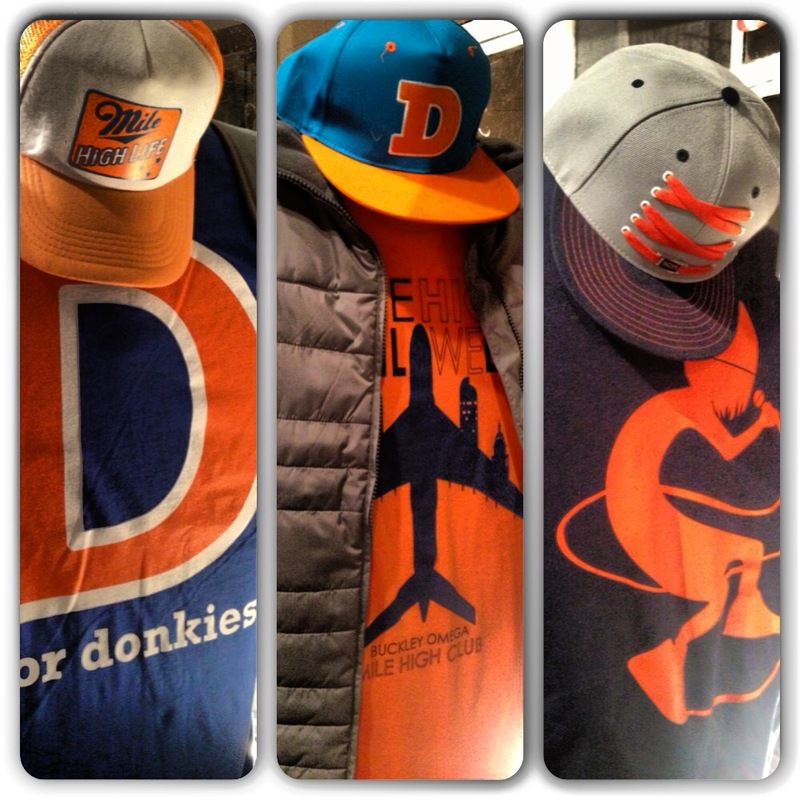 Plus, he has plenty of other sweet Donkey gear to don — as you’ll see at right.